Bharani, with 18 years of experience has been building applications since the late nineties, when he started his career as a VC++ win32 programmer. He is a connoisseur of various technologies but his passion lies in simplifying system designs. He also indulges in building strategies around data engineering and making the most of real time analytics for ThoughtWorks’ clients. Bharani in his current role as the Market Technology Principal for India and Europe devotes most of his time to shaping new pursuits, actively participating in client projects, while also crafting blueprints that eliminate projects’ SOS calls, for rescue. He collaborates with the ThoughtWorks' Technology Advisory Board that puts together thoughts on emerging technology trends in the industry, resulting in the much sought after Technology Radar. Bharani curates the technology inputs from India, Turkey and Singapore. 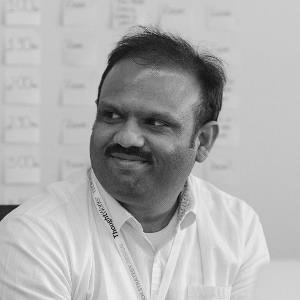 Earlier leadership roles that Bharani has held, include the Office Technology Principal for ThoughtWorks Chennai where he mentored the developer community in the region. While, Bharani’s geeky passion lies in learning and building low latency, high throughput applications, he has also capitalized on opportunities to design and build distributed systems, leveraging microservices. And what he loves most about coming to work is being surrounded by people who are smart and contribute to ThoughtWorks’ open culture, which he believes, provides a great platform for people to question, challenge and learn. The technology leader’s hobbies outside technology, include playing a mean game of badminton and watching movies that are from the Marvel Cinematic Universe.